I FFKed William for his pre-birthday cheese naan. My colleague restrung a friend’s beautiful Ibanez GIO RG (as it had rusty strings) but didn’t take into account the complications of a Floyd Rose-style floating bridge. My colleague’s friend apparently stopped going nuts over it after getting an anime-loving girlfriend. They sent the guitar to One Utama and I followed. I did try to call William, but realized that he lost his mobile phone, and was not in the office. There was a sense of elated “I’m FREEE!! !” and a sense of impending doom after my final Networking And The Internet exam. Chick 1: Hey we have an extra pass for The Sisters. 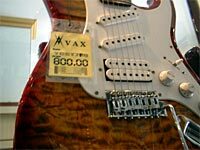 Would you like to buy it? Me: Er… I haven’t heard of the movie. Chick 2: We’ll sell it to you cheaper of course. Me: (looks over a pillar and sees a poster of the movie, thinking “oh it’s a horror movie”) Nah, I have a free tickets to collect. They then moved on to the next person in queue. At that exact moment I felt immense regret! Dumb idiot! I should’ve said, “So… which one of you lovely ladies wouldn’t be able to watch the movie?” Argh argh argh. While me going would not guarantee that they’d stay around after to chat, it should still be interesting, since it was a horror movie with a female stranger. Or two female strangers. Ah hell, if one couldn’t make it, the other one was still hot. Dammit. Dammit. I called my friend that I was supposed to meet for lunch and told her the story. “You see? I sacrificed a movie with strangers for you!” She said she would’ve understood. Grrr. 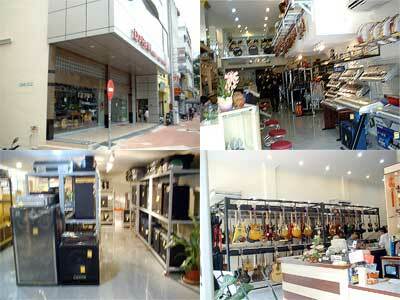 I then headed over to Do Re Mi in Chow Kit via Monorail, to drool over guitars. This is the place; it’s as wide as Bentley Music! 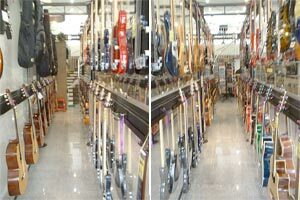 Two of the inner rows of guitars, of which loads are Samicks. 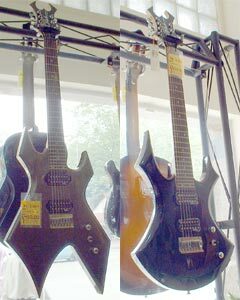 B.C.Rich is rare, what more 7-string versions. Sadly neither have floating bridges. 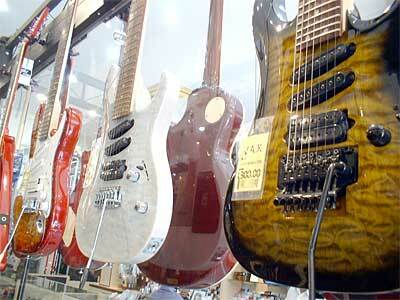 Three VAX 7-string guitars! Shiny and lickable. Yes, I did meet my friend and her taufufa-smashing bunch for lunch after all. Taufufa should not be smashed; it defeats the purpose of these sugar-water-drenched large white clumps! This entry was posted in Music, Pictures, Travelling on August 20, 2004 by 2konbla.